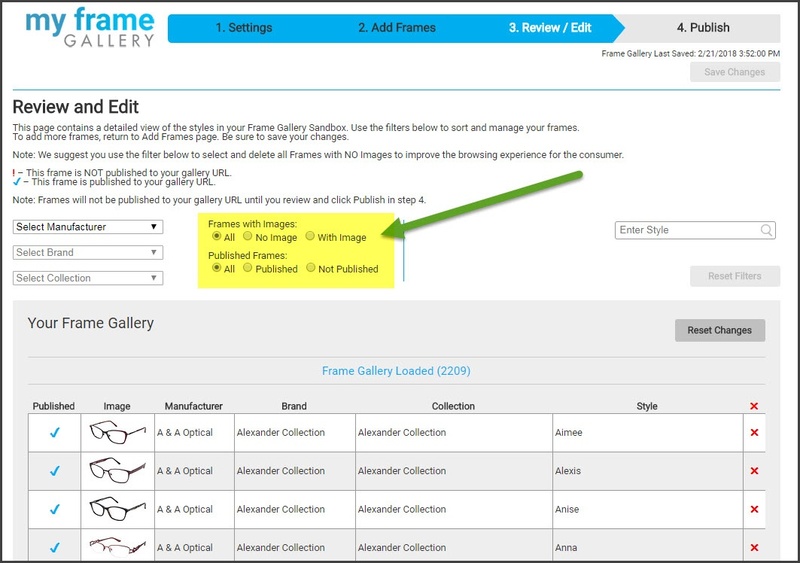 This blog post picks up from our earlier post, Customizing Your Frame Gallery: Part 1. In this post, I'll describe the 2nd and 3rd pages of the set-up process: Add Frames and Review/Edit. It's during this part of set-up that we'll actually start adding frames and building out your Gallery! 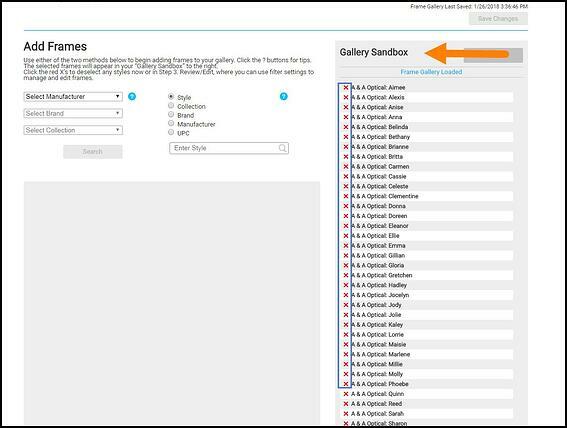 There are two ways you can search for frames to add to your gallery.The first is to use the drop down menus on the left. These drop down menus are "drill-down" style, which means you have to select Manufacturer first, then you may continue on to Brand, and then to Collection. 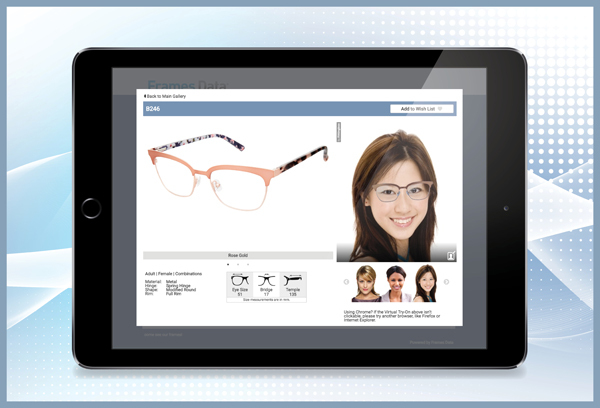 If desired, you can add an entire manufacturer, brand, or collection at once. 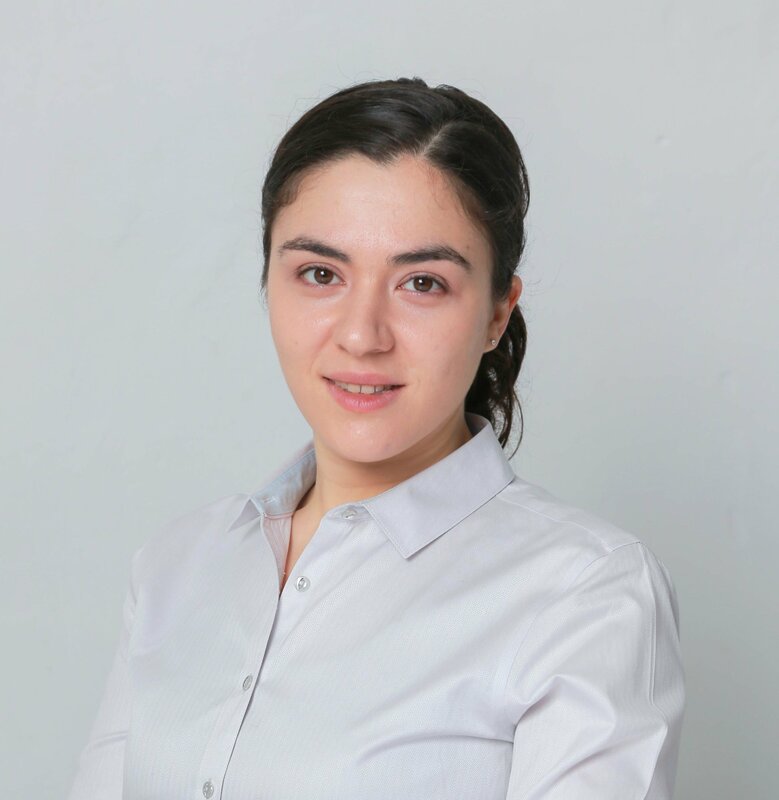 The second method is to the right of the drop down menus and is a combination of radio buttons and text search. Then, enter the name of what you are looking for into the text box. 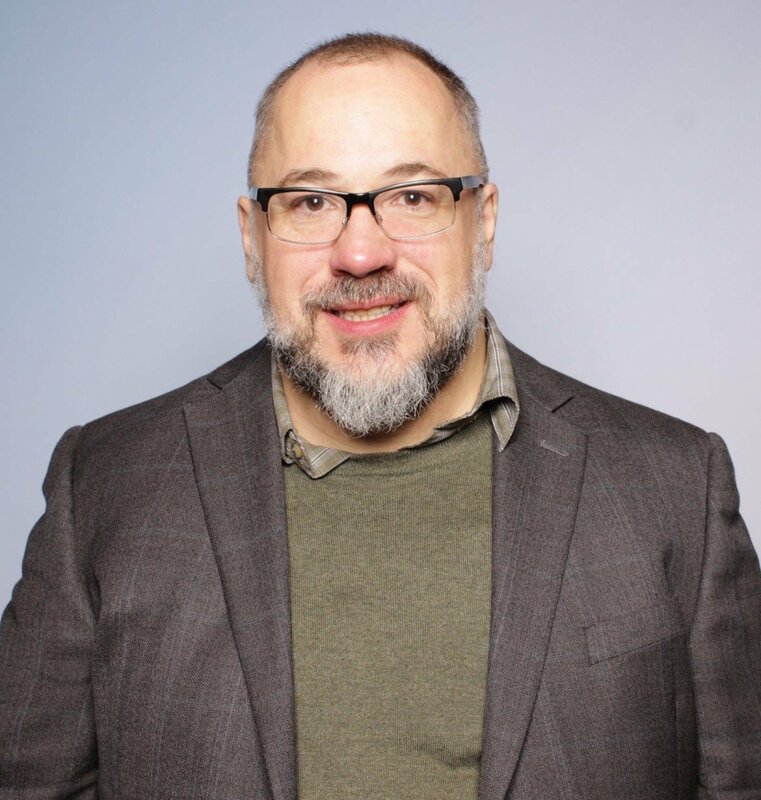 You'll notice that after you type in the first two letters, the text box will offer suggestions based on what it thinks you are looking for; continue typing and the suggestions will narrow down further. 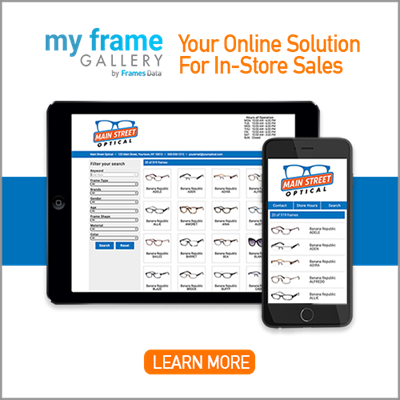 Click "Search" to return a list of frame results. Adding frames to the Gallery Sandbox. Now that you have search results, you have the option to either add all the frames returned, or you can select the frames individually by checking the check boxes in the upper right hand corner of each thumbnail. 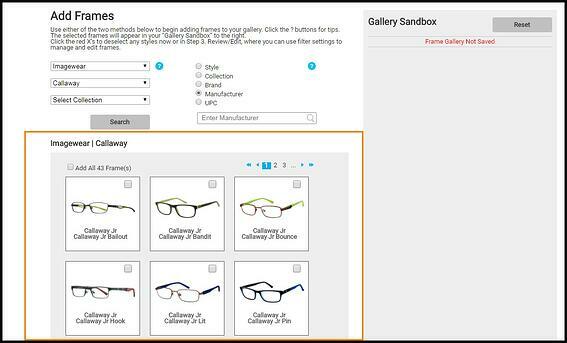 Once you've selected your frames, they will appear in the "Gallery Sandbox" on the right hand of the page. 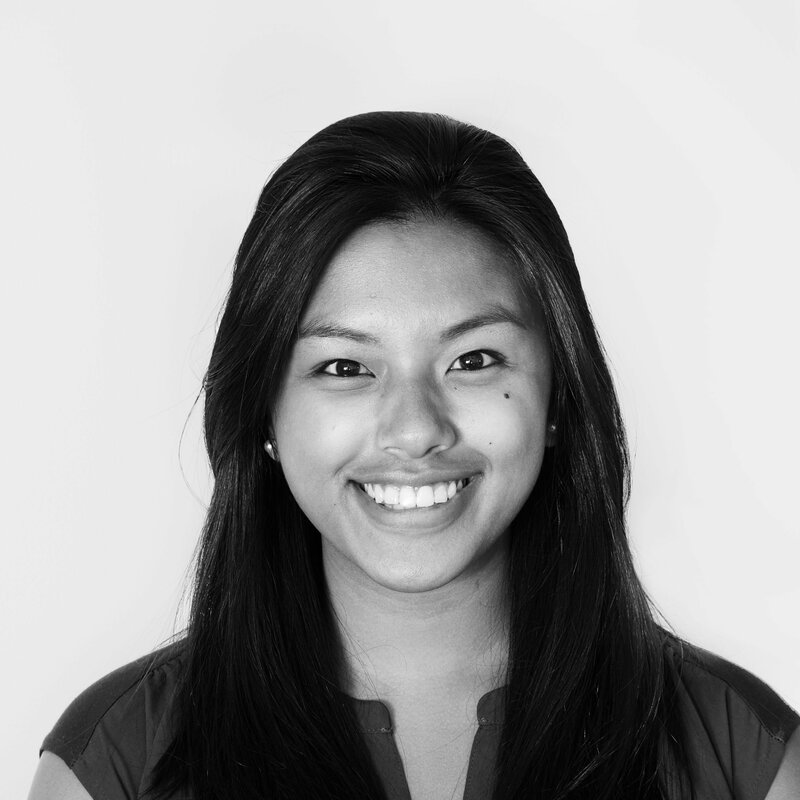 Think of the Sandbox as a holding bin for your frames before you publish them. 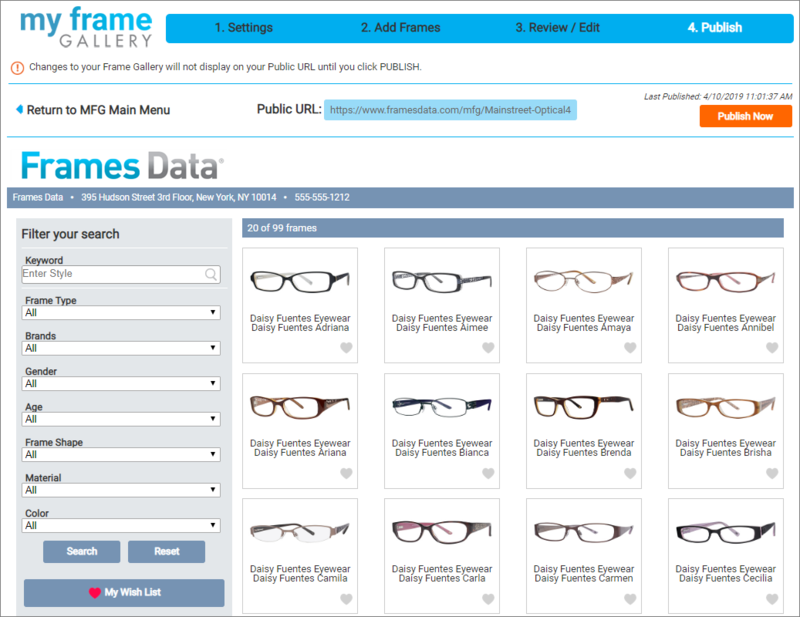 Here you can see all the frames you have added and can individually delete the frames you don't want. Before moving onto the next step on the Review/Edit page, don't forget to click save your changes! Now it's time to review your selections and discard any you don't want to display on the Review/Edit page. We suggest that you delete any frames that have no images to preserve the look and feel of your gallery. Frames without images can make the page look a little inconsistent, so we think it's best to remove them (see the area highlighted in yellow below). You can also sort by Published or Not Published frames. 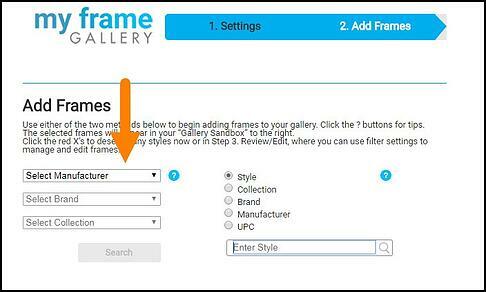 After you finished editing your frame selections, click save changes so your frame gallery will retain all the changes you just made. Remember, these frames are not yet live on your gallery. The last final step of this series will be to Publish. New and improved! 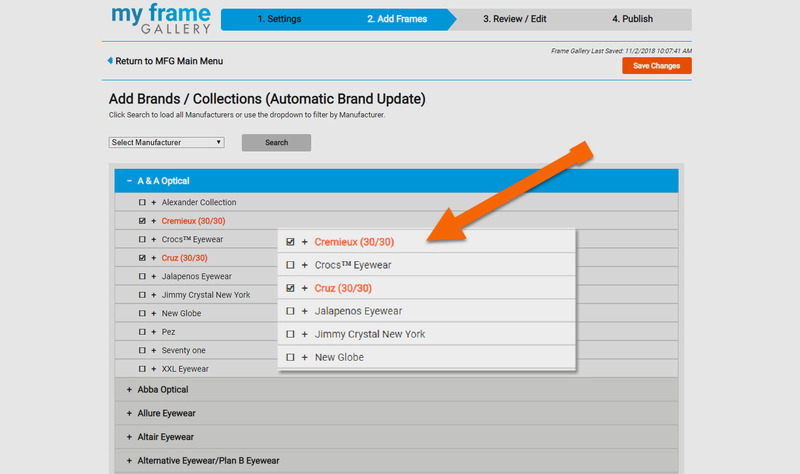 Automatic Brand Updates program keeps your online gallery current for you.